The guzheng (Chinese: 古箏), also known as Chinese zither, is a Chinese traditional plucked musical string instrument with over 2500 years of known history. It has 16 (or more) strings and movable bridges. 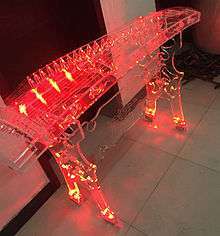 The modern guzheng usually has 21 strings with a length of 64 inches. The guzheng has a large resonant cavity made from Wutong wood (Paulownia elongate). Other components often are made from other woods; usually for structural and decorative purposes. Performers playing the guzheng often wear finger picks on the right hand or on both hands. The picks can be made of different materials such as ivory, tortoise shell, resin or hard plastic. 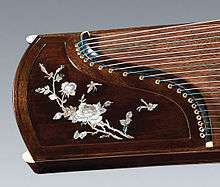 The guzheng inspired several other Asian zither instruments, such as the Japanese koto, the Korean gayageum, and the Vietnamese đàn tranh. The guzheng should not be confused with the guqin (another ancient Chinese zither without moveable bridges). The early types of guzheng emerged during the Warring States period (475 to 221 BCE). It was largely influenced by the se. It became prominent during the Qin dynasty (221 to 206 BCE), and by the Tang Dynasty (618 CE to 907 CE), the guzheng was arguably the most commonly played instrument in China. Musicological studies in the late 20th century indicate that early bamboo tube zithers might be one of the prototypes of the guzheng, koto, gayageum, and the đàn tranh. The modern guzheng is very different from ones made centuries ago, mainly due to natural evolution influenced by local as well as historical environments but also because of the adoption of Western musical styles. Strings were once made from silk but now they are almost always steel strings, which increased the instrument's capabilities, volume and timbre. There are many formalities used in the playing of the guzheng, including basic plucking actions (right or both hands) at the right portion(sometimes both sides) and pressing actions at the left portion (by the left hand to produce pitch ornamentations and vibrato) as well as tremolo (right hand). These techniques of playing the guzheng can create sounds that can evoke the sense of a cascading waterfall, thunder, horses' hooves, and even the scenic countryside. Plucking is done mainly by the right hand with four plectra (picks) attached to the fingers. Advanced players may use picks attached to the fingers of right hand or both hands. In more traditional performances however, plectra are used solely on the right hand, reflecting its use for melodic purposes and its relative importance in comparison to the left hand which is used solely for purposes of ornamentation. Ancient picks were made of ivory and later also from tortoise shell. Ornamentation includes a tremolo involving the right thumb and index finger rapidly and repeatedly plucking the same note. Another commonly used ornamentation is a wide vibrato, achieved by repeatedly pressing with the left hand on the left side of the bridge. This technique is used liberally in Chinese music, as well as in Korean Gayageum music. The guzheng is usually tuned in a major pentatonic scale with 5 notes to an octave (Do, Re, Mi, So, and La). But Fa and Ti can also be produced by pressing the strings to the left of the bridges. Well known pieces for the instrument include Evening Song from the Fishing Boat (Yu Zhou Chang Wan), High Mountain and Running River (Gao Shan Liu Shui), Plum-blossom in Three Movements (Mei Hua San Nong) and Autumn Moon over the Han Palace (Han Gong Qiu Yue). Two broad playing styles (schools) can be identified as Northern and Southern, although many traditional regional styles still exist. The Northern styles is associated with Henan and Shandong provinces while the Southern style is connected with Chaozhou city and Hakka people of eastern Guangdong province. Both High Mountain and Running River (Gao Shan Liu Shui) and Autumn Moon over the Han Palace(Han Gong Qiu Yue) are from the Shandong school, while Jackdaw Plays with Water (Han Ya Xi Shui) and Lotus on Water (Chu shui lian) are major pieces of the Chaozhou and Hakka repertories respectively. Important players and teachers in the 20th century include Wang Xunzhi (王巽之, 1899–1972) who popularized the Wulin zheng school based in Hangzhou, Zhejiang; Lou Shuhua, who rearranged a traditional guzheng piece and named it Yu Zhou Chang Wan; Liang Tsai-Ping (1911–2000), who edited the first guzheng teaching manual, Nizheng Pu in 1938; Cao Dongfu (1898–1970), from Henan; Gao Zicheng (b. 1918) and Zhao Yuzhai (b. 1924), both from Shandong; Su Wenxian (1907–1971); Guo Ying (b. 1914) and Lin Maogen (b. 1929), both from Chaozhou; the Hakka Luo Jiuxiang (1902–1978); and Cao Guifen and Cao Zheng (曹正, 1920–1998), both of whom trained in the Henan school. The Cao family from Henan are known for being masters of the guzheng. Many new pieces have been composed since the 1950s which used new playing techniques such as the playing of harmony and counterpoint by the left hand. Pieces in this new style include Harvest Celebration (Qing Feng Nian, Zhao Yuzhai, 1955), Fighting the Typhoon (Zhan Tai Feng, Wang Changyuan, 1965) and the guzheng concerto Fantasia of Miluo River(Li Huanzhi, 1984). Contemporary experimental atonal pieces have been composed since the 1980s. A more modern playing technique is using the left hand to provide harmony and bass notes, heavily influenced by the theory of Western music. This allows for greater flexibility in the instruments musical range, allowing for harmonic progression. This however also has its limitations, as it prevents the subtle ornamentations provided by the left hand in more traditional music. Students of the guzheng who take the Beijing Conservatory examinations are required to learn a repertoire of pieces both traditional and modern. There are many accomplished guzheng musicians in China, including Xiang Sihua, Wang Zhongshan Wang, Yuan Sha, Chang Jing and Funa. Although most uses of the guzheng are within Chinese classical music, the American composer Lou Harrison (1917–2003) played and composed for the instrument. Contemporary works for guzheng have also been written by such non-Chinese composers as Halim El-Dabh, Kevin Austin, David Vayo, Simon Steen-Andersen, and Jon Foreman. 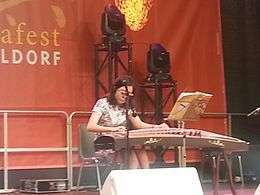 In rock music, the guzheng has been used by the Chinese performer Wang Yong (of Cui Jian), by English musician Jakko Jakszyk (on the 2011 Jakszyk, Fripp & Collins album A Scarcity of Miracles), by J.B. Brubaker of August Burns Red (on the song Creative Captivity from the 2013 album Rescue & Restore) and by virtual band Gorillaz (in their song Hong Kong from the 2005 Help! A Day in the Life compilation). Jerusalem-based multi-instrumentalist Bradley Fish used the guzheng with a rock-influenced style and electronic effects on his 1996 collaboration "The Aquarium Conspiracy" (with Sugarcubes/Björk drummer Sigtryggur Baldursson), and is the most widely recorded artist of loops for the instrument. In jazz, the guzheng was played by Zhang Yan (张燕, 1945-1996) while performing and recording with Asian American jazz bandleader Jon Jang. Other musicians who perform in non-traditional styles include Wu Fei, Xu Fengxia, Randy Raine-Reusch, Mohamed Faizal B. Mohamed Salim, Mei Han, Bei Bei He (Bei Bei), "MusicDish*China Sounds Pod2 - Opening The Year Of The Tiger". Mi2N Music Industry News Network. Retrieved 28 February 2016. Zi Lan Liao, Levi Chen, Andreas Vollenweider, Jaron Lanier, Mike Hovancsek, Chih-Lin Chou, Liu Le, and David Sait. Koto player Brett Larner developed innovative works for the guzheng utilizing longitudinal mode vibration of the strings: he also played guzheng in a duet with electronic musician Samm Bennett on his CD Itadakimasu. In the television drama series My Fair Princess, actress Ruby Lin's character Xia Ziwei plays the guzheng, although she mimes to the music. The instrument is featured in the 1980 pop hit "Everybody's Got to Learn Sometime" by The Korgis. The guzheng is the fusion of Chinese history and culture. It is not only an instrument, but also a piece of art and decoration. Artists created a unique cultural and artistic content on the instrument, and reflects Chinese art and poetry, as well as close relationship between painting and calligraphy, such as carved art, carved lacquer, straw, inlaid with mother-of-pearl (digging inlay), painting, shell carving (jade), cloisonné, etc. These are widely used as an important technology on the instrument. ↑ Deal, William E. (2006). Handbook to life in medieval and early modern Japan. New York: Infobase Publishing. pp. 266–267. ISBN 0-8160-5622-6. 1 2 3 "Hugo's window on the world of Chinese zheng". Chime. Leiden: European Foundation for Chinese Music Research. 16-17: 242. 2005. Throughout the centuries, the zheng became the parent instrument of the Asian zither family as it spread from China to a number of adjacent countries giving birth to the Japanese koto, the Korean kayagum and the Vietnamese dan tranh. 1 2 3 Howard, Keith (1995). Korean musical instruments. Oxford University Press. p. 38. ISBN 978-0-19-586177-8. The kayagum, the most popular South Korean instrument, is a 12-string half-tube plucked zither (H/S 312.22.5) (Plate 7). It resembles the Chinese zheng, Mongolian yatga, Japanese koto, and Vietnamese dan tranh. All these instruments descend from a common model, the ancient zheng. 1 2 "The Sound of History". Archived from the original on 2012-11-18. ↑ Sharron Gu (2011). A Cultural History of the Chinese Language. McFarland & Company. p. 14. ISBN 0-7864-6649-9. Han Mei. "Zheng." In The New Grove Dictionary of Music and Musicians, second edition, edited by Stanley Sadie and John Tyrrell (Oxford, 2001). Dr Sun Zhuo (28 August 2015). The Chinese Zheng Zither: Contemporary Transformations. Ashgate Publishing, Ltd. pp. 253–. ISBN 978-1-4724-1667-4. Wikimedia Commons has media related to Guzheng.